Sometimes (well let's be totally honest here....) or even possibly more than sometimes, we will use canned (read that commercially canned), purchased from the grocery store foods. And at the end of the day, it is OK. Do you want to know why? (I shall at this point just proceed like you nodded yes, in response to my question). Bring the family to the table and celebrate your own Sunday Supper! Not every recipe or meal will fit most food plans/budgets when you only cook with fresh from the market foods. 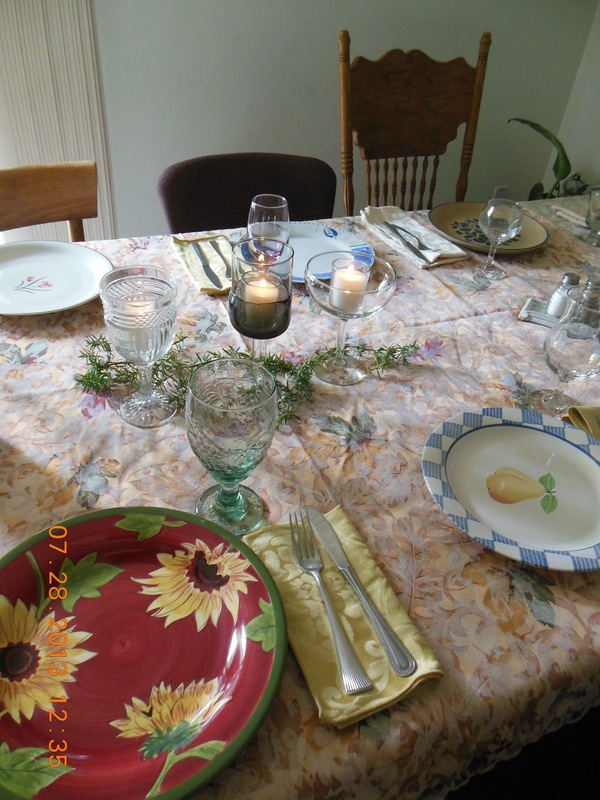 It would be wonderful to only have the freshest of everything on your table, to serve to those you love and care for. But it is not possible for most families. There are other financial responsibilities, and again, it is OK. 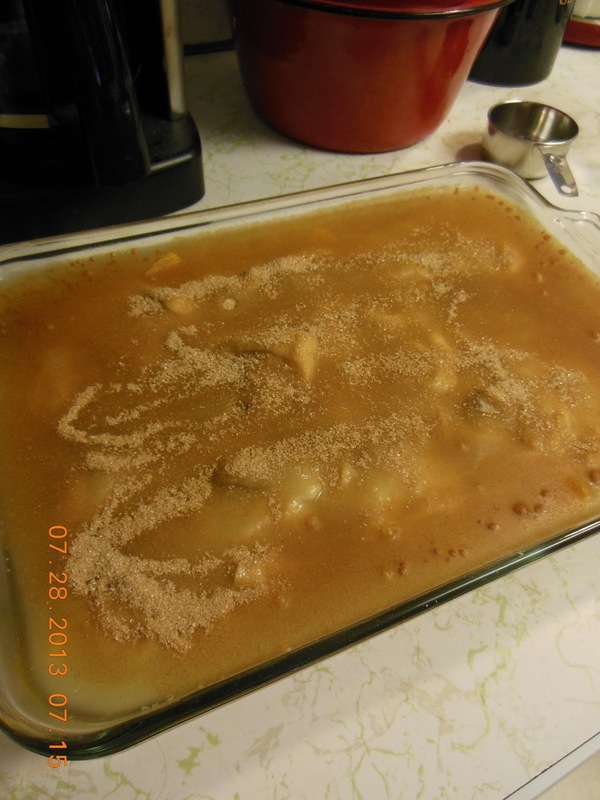 Prepare a 9X13 baking pan, add drained peaches, spreading evenly in the bottom of the pan. Combine all topping ingredients (flour through melted butter), combine well. Drop in spoonfuls over the peaches. Stir together the sugar, cornstarch, and salt. Make sure all corn starch lumps are mixed in. Sprinkle over the peaches. Bring the reserved syrup to a boil, pour evenly over the dropped topping. Combine the final sugar and cinnamon and sprinkle over the syrup. Do Not Mix. Bake 55-65 minutes or until tests done in your oven. Let cool, serve with vanilla ice cream or a spoonful of vanilla yogurt or whipped cream. My husband loves fruit cobblers. Sometimes you just have to bake, even when fresh fruit isn't available. I agree, and this cobbler is so tasty! This sounds really good! Thanks for sharing on the What's for Dinner link up! Cobblers are my FAVORITE! Although I do prefer apple, peach is a close second. Thanks for sharing on the #wastelesswednesday blog hop! 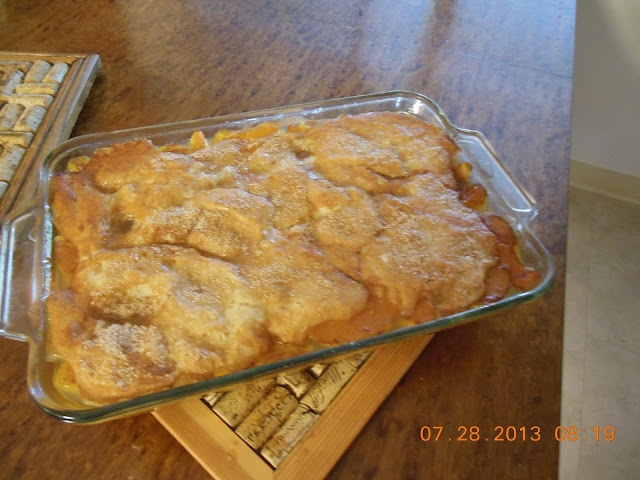 Your Peach Cobbler looks lovely, Melynda! Shared on the Hearth and Soul Facebook page. Thank you so much for your support of the Hearth and Soul Link Party! Peach Cobbler is one of my favorite cobbler's this looks fabulous! Hope you are having a great week and thanks so much for sharing with us at Full Plate Thursday! You are welcome Miz Helen.